This week we’re knitting with Sweet Roll yarn by Premier Yarns. This long color repeat self-striping yarn is ideal for sprucing up shadow knitting with worry-free color changes. This is what we’ll explore today, while yesterday we looked at some free patterns provided by Premier Yarns. 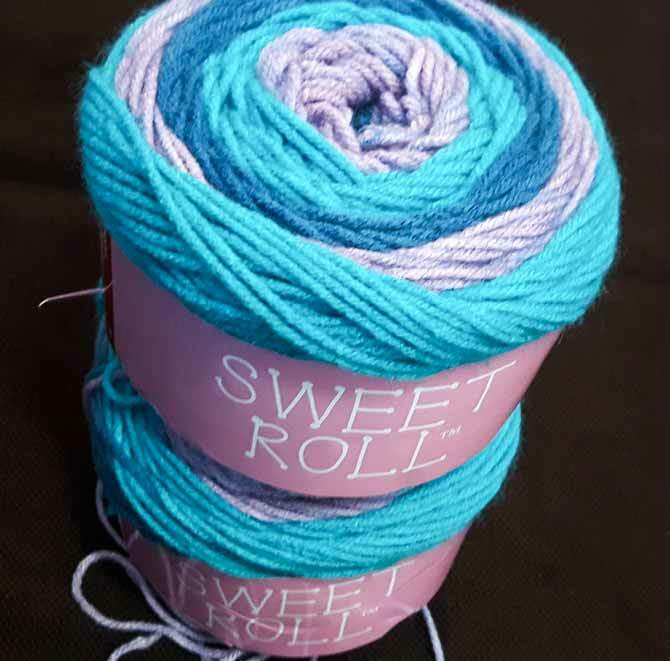 Sweet Roll yarn stacks up to your most imaginative ideas. The Punch Pop colorway features lavender, bright turquoise, and a rich teal. 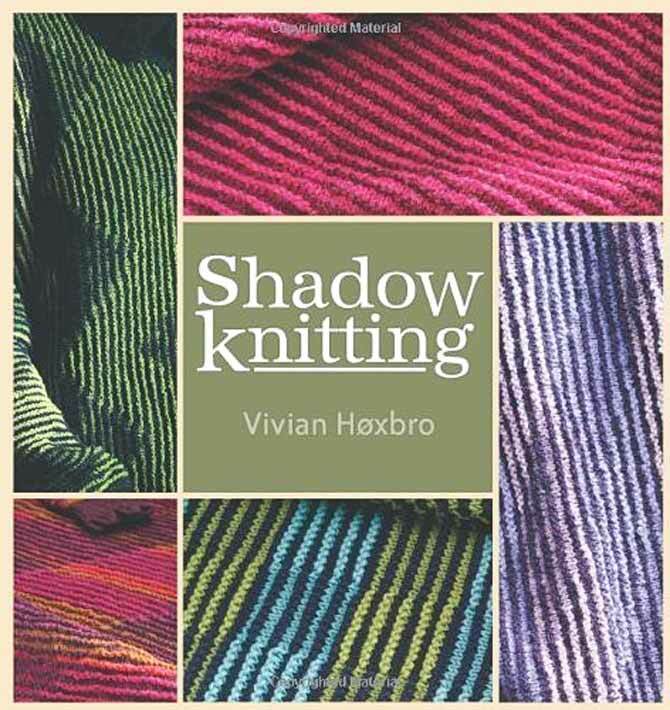 History of Shadow Knitting and many patterns can be found in this volume by Interweave. Shadow knitting is a great way for beginners to do colorwork without knitting with two colors at the same time on the same row. 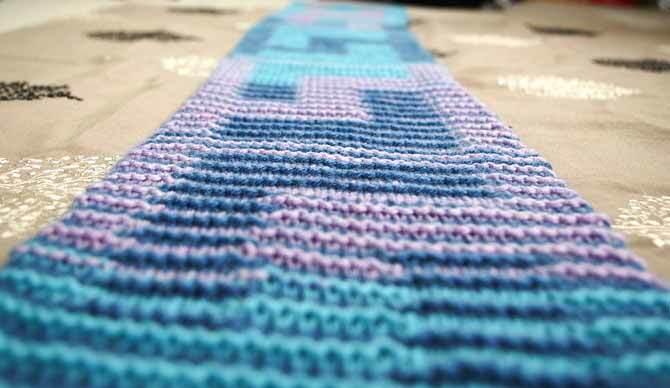 It involves knitting 2 rows in one color and then 2 rows in the next color and then alternating back and forth. The strands of the unused color are loosely carried up the side of the project where each color row begins and ends. When you do this, you basically get stripes. 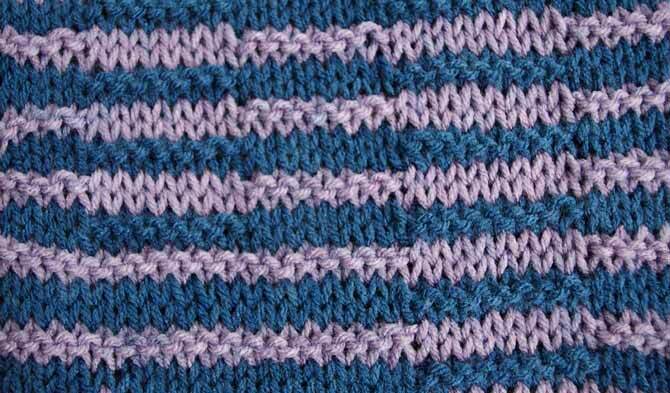 If you only knit you get garter stitch ridges, and if you knit one row and purl one row you get stockinette stripes. Like these. If you look a little closer at the pattern, you’ll notice that on a few of the stripes things look a little wonky. Perhaps to the untrained eye, it would look like a mistake. But these irregularities my friend, are what make shadow knitting what it is. If you look at the knit fabric surface from any angle that’s shallower than a perpendicular bird’s eye view, you’ll start to see some changes in the color and the texture of the fabric, and what you’re seeing are the shadows that the alignment of certain stitches creates. On this scarf, you’ll notice a series of L-shaped blocks arranged in a motif that’s called a Greek Key. I made up a simplified version of a Greek Key because some of them can get quite complex and have a variety of corners and parallel lines. Looking at the scarf at a 30 degree angle makes the Greek Key pattern jump out at you. To make the shadows, the knitter uses strategically placed purl stitches that create raised garter stitch ridges that run one half row off-set of the other garter stitch ridges. It’s a thing of beauty. Sweet Roll yarn added a cool element to shadow knitting in that the color changes add a whole different dimension to the shadows. I used almost all of 2 rolls of the same colorway, Punch Pop in this case. To ensure that you don’t end up with the same color overlapping, it’s necessary to unwind all of one color from the center of the roll so that when you use the yarn from one ball to be on color of stripe, it always contrasts the yarn from the other ball. If you use two different colorways together you won’t have to do this step. In the picture below, you can see how the colorways “chase” each other across the length of the scarf, making it look like there are more than 3 colors in the colorway. Bird’s eye few of alternating stripes of Sweet Roll Punch Pop makes it look like you have more than 3 colors. My wife knit this for me and she really enjoyed the pattern. It was one that she could take with her to knit-night because it doesn’t take too much concentration. She loved the feel of Sweet Roll as she knit with it, and the end result is a soft scarf with beautiful drape and a squishy feel to it. If you’d like to try to knit this scarf and see how you like shadow knitting, I’ll include the pattern for this scarf below. Gauge isn’t essential for this project. Cast on 34 stitches with yarn A (your first ball of yarn). Place a locking stitch marker around the yarn going to ball A. Rows 1-2: K34 in A. Rows 3-4: K34 in B. Row 9: K34 in A. Row 10: P6 in A, k22 in A, p6 in A. Row 11: K34 in B. Row 12: K6 in B, p22 in B, k6 in B. Rows 13-20: Repeat Rows 9-12. Row 21: K34 in A. Row 22: P21 in A, k7 in A, p6 in A. Row 23: K34 in B. Row 24: K21 in B, p7 in B, k6 in B. Rows 25-32: Repeat Rows 21-24. Row 33: K34 in A. Row 34: P6 in A, k8 in A, p7 in A, k7 in A, p6 in A. Row 35: K34 in B. Row 36: K6 in B, p8 in B, k7 in B, p7 in B, k6 in B. Rows 37-44: Repeat Rows 33-36. Row 45: K34 in A. Row 46: P6 in A, k8 in A, p7 in A, k7 in A, p6 in A. Row 47: K34 in B. Row 48: K6 in B, p8 in B, k20 in B. Row 49: K34 in A. Row 50: P6 in A, k8 in A, p20 in A. Rows 51-54: Repeat Rows 47-50. Row 55: K34 in B. Row 56: K6 in B, p8 in B, k20 in B. Row 57: K34 in A. Row 58: P6 in A, k22 in A, p6 in A. Row 59: K34 in B. Row 60: K6 in B, p22 in B, k6 in B. Rows 61-68: Repeat Rows 57-60. Repeat Rows 5 to 68 until you’ve reached desired length minus ½”. Knit 4 rows. Bind off purlwise. 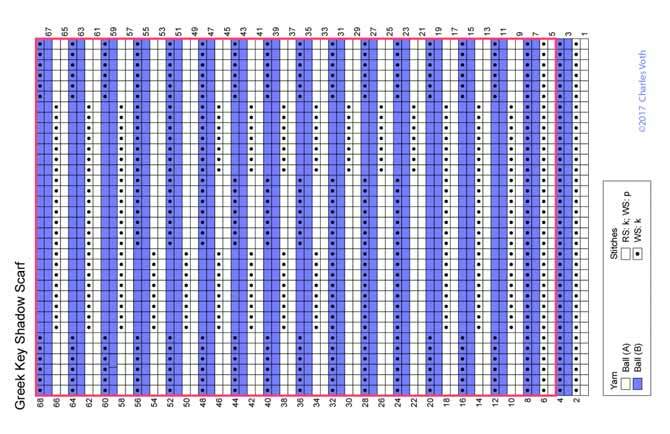 Chart for shadow knitting Greek Key scarf. Tomorrow, we’ll look at another way to use Sweet Roll colors in a unique way.